Have a look at the full article with the pictures here. 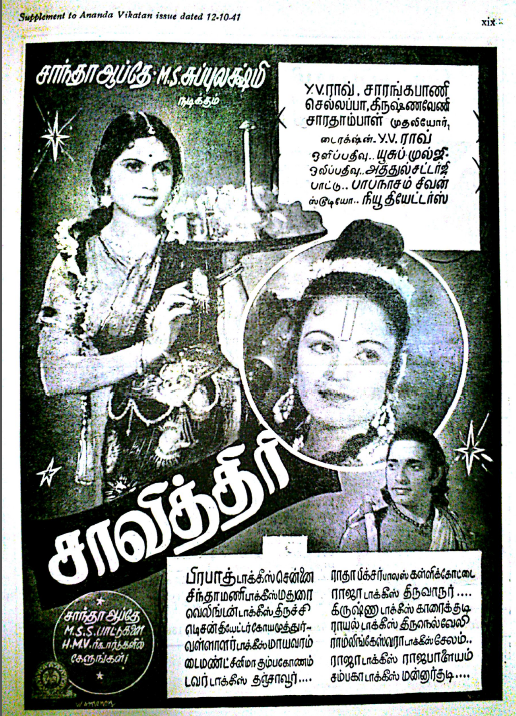 Meanwhile we have been busy at our archives and we found an advertisement of the film Savitri where MS played Naradar, A male character. The ad was found in the supplement of the Tamil Magazine Ananda Vikatan dated 12-10-41. This entry was posted in Others, Tamil Cinema and tagged Ananda vikatan, Arts, Arts and Entertainment, Asia, Carnatic music, Chennai, cinema, Cinema of India, cinemas of india, film, film history, film memorabilia, HMV, India, Indian cinema, M S Subbulakshmi, madras, MS, MSS, Savitri, tamil, Tamil cinema, TCRC. Bookmark the permalink.